Whether wood-grilled pollo a la brasa or citrusy ceviche with corn kernels and sweet potatoes, Los Angeles has always had a powerful love affair with Peruvian food. Rather than being concentrated in a single neighborhood, you’ll find stellar Peruvian restaurants all over town, perhaps a testament to its wide appeal among those who didn’t necessarily grow up eating arroz chaufa or deep-fried picarones. Drawing influence from Spanish colonizers, Japanese and Chinese immigrants, as well as indigenous populations native to the country’s four distinct regions (Amazon jungle, Andes mountains, high desert, and coastline), the country’s cuisine encompasses a staggering array of ingredients, techniques, and traditions. And more importantly perhaps, it’s super delicious. How lucky are we, then, to be able to experience a taste of that deep culinary heritage right in our own backyard. Here are 10 of our favorite spots for Peruvian food in L.A.
One of the city’s most reliably popular Peruvian restaurants, Hollywood-adjacent Mario’s has been a strip mall mainstay for decades. There’s often a wait during peak meal times, but it feels like a small hurdle once the restaurant’s bright ceviches and smoky, stir-fried lomo saltado land at your table. It’s hard to go wrong with the menu here (hint: if you’re craving fried chicken, try the crispy chicharrón de pollo), but whatever you order don’t forget to make ample use of the house aji verde, a creamy piquant sauce made from aji amarillo peppers and herbs, which sits in giant squeeze bottles on each table. 5786 Melrose Ave., Hancock Park, 323-466-4181. The tiny chicken shack spewing poultry-scented smoke along Western might be gone (it was torn down and replaced by a larger space next door earlier this year), but the legend of Pollo a La Brasa still lives on. Like every other customer in line, you’re here for the famed wood-fire rotisserie chicken, cooking using the firewood stacked in neat piles outside and piled onto a paper plate with thick-cut french fries, salad, and a few warm tortillas. The chicken is juicy and fragrant with garlic and spices, the charred skin is smoky and crisp. It’s no surprise that some of the most well-known chefs in L.A. call themselves regulars. 764 S. Western Ave., Koreatown, 213-387-1531. Though ostensibly a pollo a la brasa spot, Takatis offers a deep roster of Peruvian dishes—everything from tallarin verde (Peruvian-style spaghetti with pesto) to arroz chaufa (Peruvian-style fried rice). But the the star of the show at this Valley strip mall favorite is the delicious sanguchon, a hulking street food creation that consists of a large roll split and filled with roast chicken, fried yams, lettuce, tomato, a hard-scrambled egg and a dense blanket of melted cheese. There’s also a kind of special sauce in there too, a little like Thousand Island, and a handful of crispy potato sticks throw on top for crunch. It’s less of a sandwich and more of a three-course meal stuffed between bread. 6470 Van Nuys Blvd., Van Nuys, takatisperuviancuisine.com. Pablito’s Kitchen, operated by Danny Rodriguez and chef Charles Thomson, started off as a roving truck before settling down into a brick and mortar in Burbank two years ago. The Peruvian cooking here has a decidedly pan-Asian slant, nodding to and expanding on the culinary influence that Japanese immigrants have had on Peruvian cuisine. The “Nikkei” ceviche is made from sashimi-cut tuna tossed with aji amarillo dressing and topped with crispy seaweed, the Peruvian Ramen (!) combines roasted chicken with a soy-marinated egg and bouncy egg noddles, and the “Banh Mi de Camarón” comes packed with pickled veggies and shrimp tempura drizzled in pepper sauce. 3803 W. Burbank Blvd., Burbank, pablitoskitchen.com. You might not expect to find soulful Peruvian food served out of a small Culver City bakery, but that’s exactly what Lonzo’s has been doing (and doing well) for the past couple years. The restaurant consists of a handful of tables in front of a display case filled with bread and pastries, but there’s a surprising amount of ambition in the cooking here: mixed seafood fried rice, steamed mussels topped with crab meat and salsa criolla, and seco de cordero, a beer-braised lamb stew garnished with cilantro. If you’re feeling something summery, try the mango shrimp ceviche studded with bits of sweet, pulpy fruit. 10804 Washington Blvd., Culver City, lonzosrestaurantandbakery.com. Some restaurants are hidden gems, others are full-blown treasure troves. Mex Perú Gipsy, a cozy lunch counter hidden among the hubbub of downtown’s Fashion District, is definitely in the latter camp. 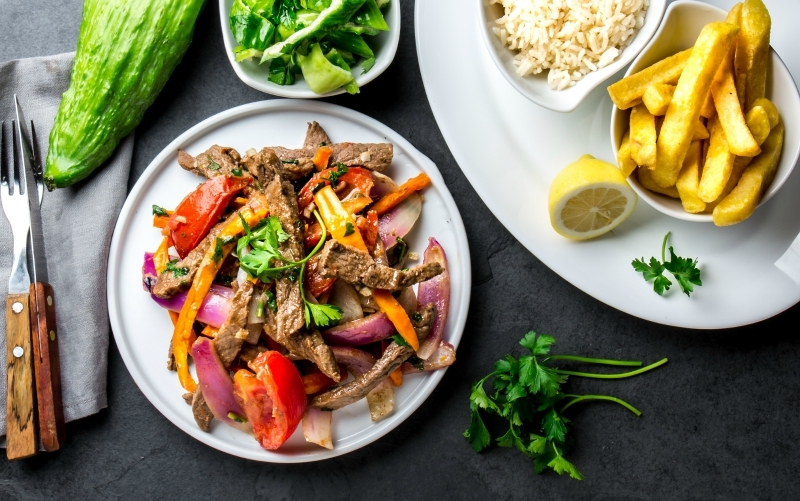 Owner Juan Alfaro has been serving both Mexican and Peruvian food to hungry crowds of locals and visitors for over three decades, and no dish is more famous here than the excellent lomo saltado, well-marinated and perfectly seared in a large wok. If you somehow have room, try the refreshing ceviches, arroz chaufa, or salchipapas, a baroque construction of stir-fried sliced hot dogs and French fries slathered with ketchup, mayo, and onions. 414 E 12th St., downtown, 213-748-1773. Located at downtown’s Smorgasburg L.A. market on Sundays, this popular Peruvian-inspired vendor translates traditional dishes like lomo saltado and papa a la huancaina (potatoes with cheesy pepper sauce) into a format with which Angelenos are well acquainted: the taco. Served on organic, hand-pressed tortillas, Little Llama’s colorful combinations range from pomegranate-glazed pork belly with fresh corn polenta and cotija to beer-marinated grilled chicken with fried mashed potatoes and salsa criolla. To drink, there’s housemade versions of the Peruvian purple corn punch chica morada, and maracuyá, made from passionfruit juice. 785 Bay St., downtown, littlellamatacos.com. A fixture along 4th Street’s Retro Row, the slightly upscale Aji Peruvian is known as one of Long Beach’s strongest options for Peruvian food. True to reputation, the kitchen offers compelling takes on everything from mashed potato causas to anitcuhcos (grilled meat skewers) to tacu tacu (Peruvian rice and beans), along with a respectable wine and beer list to boot. Though the lofted-ceiling dining room seems suited for a leisurely dinner, you can also keep it casual at the newly opened Bodega Sanguchería Peruana next door, which sells traditional sandwiches, pastas, desserts, and snacks. 2308 E. 4th St., Long Beach, ajiperuviancuisine.com. For Peruvian Americans who grew up in the South Bay, El Pollo Inka offered more than just rotisserie chicken and arroz con pollo. With live music on weekends and a large dance floor, it doubled as a informal gathering place for local Peruanos during soccer games, weddings, or other big events. You’ll find several locations of El Pollo Inka across the county, making it L.A.’s biggest—and perhaps only—Peruvian restaurant chain (there’s also an outlet in Miami). The most popular location is probably the massive one in Torrance, decorated to vaguely resemble an ancient Incan temple, where you can sip Pisco Sours and enjoy crumbly butter cookies called alfajores for dessert. 23705 Hawthorne Blvd., Torrance, elpolloinka.net (also locations in Gardena, Lawndale, Hermosa Beach, and Rolling Hills Estates). Former Mo Chica chef Ricardo Zarate, the guy leading the charge for modern Peruvian cuisine in the U.S., has hit his stride at his latest restaurant, housed inside an airy dining room in West Hollywood. His refined cooking here centers on Peruvian cooking’s core tenets. Most notable of all is fire, evidenced in flame-kissed shrimp with yuzu kosho and plancha-seared steaks. The bracing ceviches for which Zarate is rightly famous are in full force, too: pristine scallop and sea urchin floating in leche de tigre with fried garlic, or delicate Ensenada sea bass in a yuzu-walnut dressing. If you’re looking for the highest form of Peruvian food as it exists in L.A., this is the place to find it. 8479 Melrose Ave., West Hollywood, rosalinela​.com. RELATED: The Best Cuban Restaurants and Cafes in L.A.